Release of our Bid Writing Book!! To be released on the 19th March 2018, this book brings together over 30 years of know-how in creating and crafting successful bids for tendered contracts. Author, David Molian, is an Oxford Graduate and was Director of the Cranfield School of Management’s renowned Business Growth Programme for many years. He has consulted numerous companies on developing their brands and growing their businesses. Co-authors and Bidwriting.com founders, Martyn Curley and Steve Oldbury, have also advised many UK business-to-business organisations across 35 commercial sectors. We believe this book is an invaluable guide for bid managers and bid writing teams, as well as anyone with an interest in bidding. Based on extensive research, our book explains what bid evaluators are really looking for by deconstructing the questions asked and explaining how to answer them to achieve top scores. 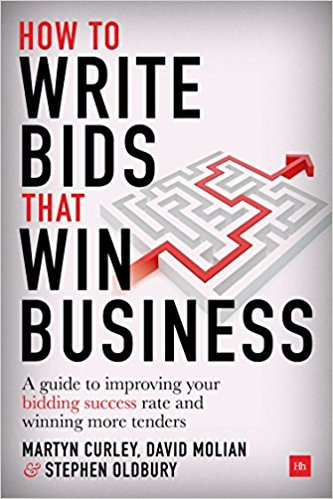 If you are looking to take your organisation’s bidding performance to the next level, or improve profitability and morale throughout your business, How to Write Bids that Win Business is the book you need.